Constitutive models play a key role in predicting the behaviour of geotechnical problems, which is often very complex. 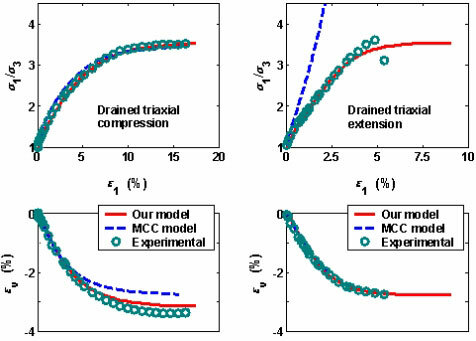 Conventional elastoplastic models, although widely used and very powerful, have difficulty in describing the variation of tangential stiffness with the strain-increment direction and shear-dilatancy in the hardening regime. Many new types of constitutive models have been proposed to overcome this problem, such as bounding surface models, subloading models and hypoplastic models. Among these general plasticity approaches, hypoplastic models have the merits of a clear physical concept, a simple mathematical formulation and an easy numerical implementation. In hypoplasticity, the incremental stress-strain relation is described by a nonlinear tensor-valued function. The precise formulation of this tensor function requires a sound understanding of soil behaviour. A simple hypoplastic constitutive equation has been developed in Newcastle which can capture, quantitatively, the response of normally consolidated clay under drained and undrained tests. The model requires just 5 key parameters that can be easily determined from laboratory tests. The figures below show the predictions of our proposed model for Fujinomori clay under drained and undrained shear testing. Granular materials are widely encountered in civil engineering and other engineering disciplines. Typical examples include sand, gravel, crushed rocks, salt, sugar, cereal, and pharmaceuticals. In such materials, stresses are transmitted by direct contact between the grains and, due to their discrete nature, the overall behaviour is very complex. A granular material flows in a rather different way to a common fluid as it can sustain shear stress like a solid when confined. The shear strength is basically governed by interactive friction between the grains, whose shape, size and hardness play an essential role. 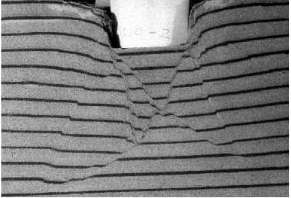 The macro-response of a granular material is also strongly affected by the voids (or density of the packing) and by the confining pressure applied to it. Modelling and predicting the responses of granular materials is a very challenging task. Two different approaches, the discrete mechanics approach and the continuum mechanics approach, are commonly used for this purpose. Presently we have worked with the continuum mechanics approach. Based on a homogenization process, a granular body can be idealized either as a classical continuum or a micropolar continuum. For modelling post failure behaviour, such as heterogeneous and localized deformation and stationary flow, the classical continuum models may suffer from a loss of well-posedness in their mathematical description of certain boundary value problems. For example, numerical results from the modelling of shear localization are very sensitive to the initial conditions and the mesh size and alignment. Due to the lack of an internal length scale in the constitutive model, the predicted thickness of the shear bands is governed by the element size and incorrect predictions are obtained. These problems associated with the classic continuum description may be overcome by using a micropolar continuum model. Based on a classical (nonpolar) hypoplastic constitutive model for sand, we have formulated a micropolar continuum extension which incorporates the critical state concept and takes into account the effects of grain size. The model can reproduce the post-failure behaviour of granular materials and predicts a shear band thickness which is governed by grain size rather than element size. 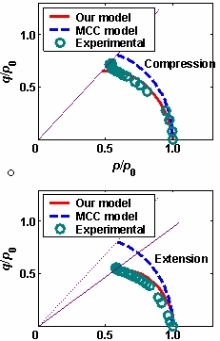 The results from modelling the shear of a granular layer with either a nonpolar or a micropolar continuum model are presented in the adjacent figures. Also presented is the micropolar continuum failure pattern for a footing on sand.